Correspondence sent and received by the Kansas Adjutant General's Office. Albert J. Davis succeeded Henry H. Artz as Adjutant General in April 1894. 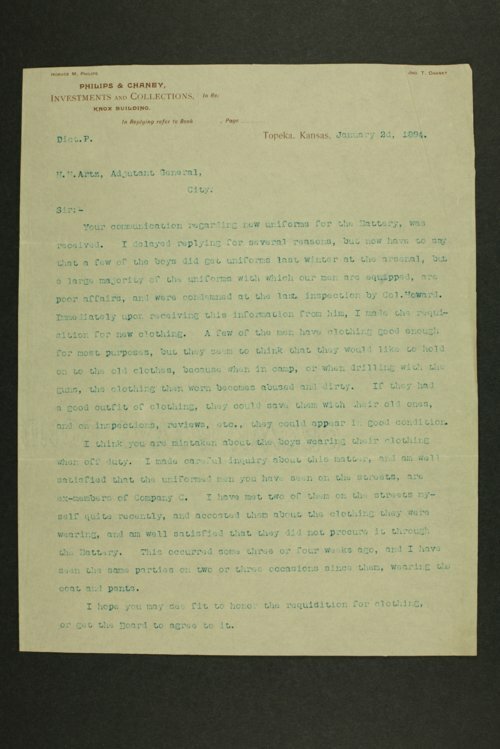 Included in this correspondence are ordnance returns of Captain Willard E. Whitaker and a report from the assistant surgeon at Camp Townsend in Ottawa, Kansas. Frequent correspondents include Brigadier General William H. Sears, Quartermaster General Charles A. Taylor, Lieutenant Governor Percy Daniels, and Colonel C.J. Garver.